Masquerading as an action-filled sci-fi/horror hybrid, John Carpenter‘s 1988 film They Live is ultimately a relatable denunciation of consumerism, an attack on how advertising has seeped into nearly every facet of our lives. And perhaps it is the film’s overt message that has made it inspirational for three decades now, it’s influence felt in practical objects like Ivan Cash / IRL Labs‘ IRL Glasses as well as in more creative endeavors, such as Shepard Fairey‘s now-famous use of the slogan “OBEY” in his art. Adding himself to the ever-growing list of those who pay homage to They Live, artist Aaron Moreno has painstakingly modified his own MEATS form (learn more here) into the likeness of the film’s antagonists, creating his Retroband guise’s CONSUME MEATS edition. Only visible in color during the film’s final act, They Live‘s alien invaders resemble corpse-like corruptions of the human form, reddish patches occasionally overtaking their otherwise turquoise blue skin, their bulging eyes made all the more prominent by their lack of lips. To simulate this appearance on his three-year-old MEATS form, Moreno patiently applied seven layers of paints over his prototype blue vinyl base, finishing each of these twenty hand-painted pieces with specially cast bulbous orbs topped with a metallic coating. And the completed works are each a perfect tribute to They Live, one which is appropriately titled CONSUME MEATS. 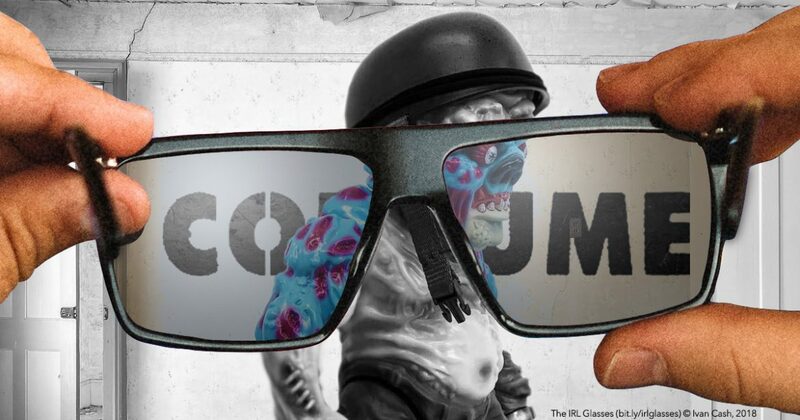 As for the aptness of this limited edition’s name, it stem’s from a core concept in the film wherein humans discover the means – through special sunglasses — to see past the alien’s veneer. Not only unveiling the invaders’ true appearance, this also uncovers the subliminal messaging that underlies the world around us: the bikini-clad model on an ad becomes the words “MARRY AND REPRODUCE”, dollar bills simply read “THIS IS YOUR GOD” instead, and racks of magazine covers simply display the commands to “OBEY” and “CONSUME”. And it is this last example that Moreno utilizes for the hand-painted packaging of his CONSUME MEATS edition, capturing the word pristinely on an otherwise white background, similar to how these slogans appear in the film. Ultimately, as Andy Warhol professed, art is a commodity, a fact that makes these immaculately executed tributes to an anti-consumerist film all the more honest, proclaiming themselves as something you want to “CONSUME”.